The Greater Wilmington Region is bisected by East/West Interstate 40, which provides an expressway from the international, deep-water seaport in Wilmington to Southern California. Interstate 40 offers a connection to North/South Interstate 95 within one-hour drive in Benson, NC. Interstate 73/74, already under construction, will connect the region with Detroit and the Midwest and is within a 30-minute drive via Interstate 40. By locating in the region, companies enjoy an excellent infrastructure; transportation access by highway, rail, seaport and air; superb quality of life; and a pro-business attitude second to none. The state’s largest river, the Cape Fear, bisects the region on its way to the coast. The predominantly flat topography of this region – which often makes construction less complicated and much less expensive – gradually gives way to the gentle rise and fall that eventually becomes our state’s spectacular Blue Ridge Mountains. The Port of Wilmington is strategically located on the East Coast of the United States within 700 miles of more than 70% of the U.S. industrial base. Recent and ongoing improvements to regional and national highway networks make surface transportation supporting the Port of Wilmington superior to neighboring ports. And CSX Transportation provides intermodal rail service with best-in-class transit times, as well as daily service for boxcar, tanker and general cargo services. The Port of Wilmington is one of the few Southern ports with readily available berths and storage areas for containers and cargo. Specifically, it offers terminal facilities serving container, bulk, breakbulk, and ro-ro operations. It offers a deep 42-foot navigational channel, nine berths with 6,768 feet of wharf frontage, two neo-Panamax cranes (with one more on the way) and four post-Panamax container cranes. Modern transit and warehouse facilities and the latest in cargo management technology provide a broad platform for supporting international trade to the fast-growing Southeast U.S. market. The Port of Wilmington has ample capacity to support today’s cargo volumes and continues to invest in the expansion of its facilities to meet projected growth in international trade, with an ongoing $200 million infrastructure investment project. The Port is a C-TPAT Certified location and is designated as Foreign Trade Zone 214. 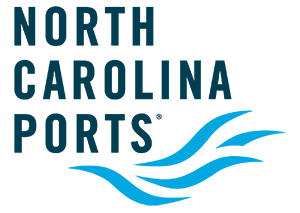 Channel depth is 42 ft.
Wilmington International Airport (ILM) provides a convenient travel experience for companies and people in Southeastern North Carolina seeking reliable links to the global marketplace. In 2018, ILM served 934,058 passengers. The growing facility proudly hosts American Airlines, Delta and United, which together serve eight non-stop destinations, seven hubs, and six international gateways. ILM also has a Fixed Base Operator, as well as a full-service aircraft maintenance facility supporting corporate and general aviation. Another unusual asset is the airport’s first-class commerce park: ILM Business Park encompasses 140 acres and is conveniently located on ILM property. All parcels and buildings at the business park offer flexible site layouts and are part of the Foreign Trade Zone #214, with magnet site status. For more information on ILM, please visit flyILM.com. CSX is the chief rail service provider to southeastern NC. With 17,000 miles of track throughout the state, CSX enables private industries as well as the Port of Wilmington the ability to move product quickly and efficiently. Click here for more information about CSX services in North Carolina. The Greater Wilmington Region is bisected by East/West Interstate 40, which provides an expressway from the international, deep-water seaport in Wilmington to Southern California. Interstate 40 offers a connection to North/South Interstate 95 within one-hour drive in Benson, NC. Interstate 73/74, already under construction, will connect the region with Detroit and the Midwest and is within a 30-minute drive via Interstate 40. Click here for more information about the highway infrastructure in North Carolina.